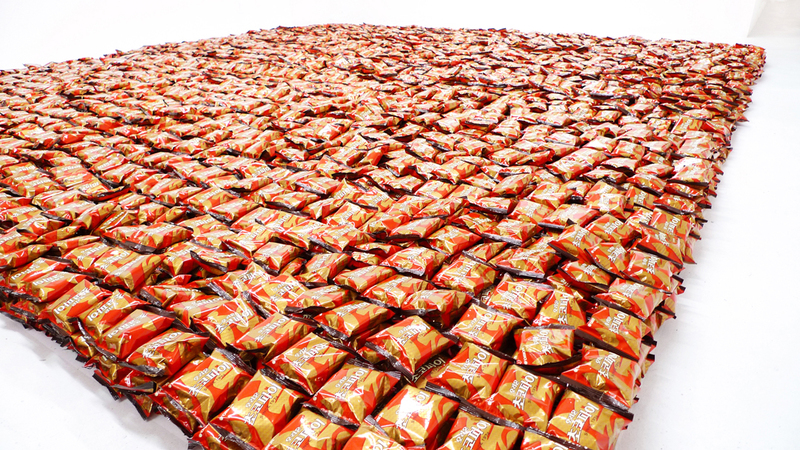 Date Work Completed: 2014 Medium: 10,000 Choco-Pie Installation Site specific, interactive, audience participation installation Size: 153 x 159 x 5 inches Description: At the Ethan Cohen New York gallery, Alongside paintings hung on the walls, the installation of Choco·Pies for the audience to eat promotes Korean unification and global peace through a Gonzalez-Torres style floor piece. The food is a South Korean confectionary has become an overnight sensation in North Korea as a smuggled good. Other: Choco-Pies were kindly donated by the South Korean manufacturing company Orion Co.